Our readings this Sunday are all about the wideness of God's mercy and the inclusion of all peoples in the kingdom of God. In our first reading (Isaiah 56:1, 6-7), the prophet Isaiah, speaking on behalf of God, prophesies the day when all peoples who "join themselves to the Lord" will be welcomed into the house of the Lord. Thus says the LORD: Observe what is right, do what is just; for my salvation is about to come, my justice, about to be revealed. The foreigners who join themselves to the LORD, ministering to him, loving the name of the LORD, and becoming his servants -- all who keep the sabbath free from profanation and hold to my covenant, them I will bring to my holy mountain and make joyful in my house of prayer; their burnt offerings and sacrifices will be acceptable on my altar, for my house shall be called a house of prayer for all peoples. In our Gospel reading (Matthew 15:21-28), we hear of a Caananite (Pagan) woman who, though considered as a "dog" by Jews of the day, showed her great faith, "joining herself to the Lord". She begged Jesus to heal her daughter. After testing her three times, Jesus praised her faith and healed her daughter. At that time, Jesus withdrew to the region of Tyre and Sidon. And behold, a Canaanite woman of that District came and called out, "Have pity on me, Lord, Son of David! My daughter is tormented by a demon." But Jesus did not say a word in answer to her. Jesus' disciples came and asked him, "Send her away, for she keeps calling out after us." He said in reply, "I was sent only to the lost sheep of the house of Israel." But the woman came and did Jesus homage, saying, "Lord, help me." He said in reply, "It is not right to take the food of the children and throw it to the dogs." She said, "Please, Lord, for even the dogs eat the scraps that fall from the table of their masters." 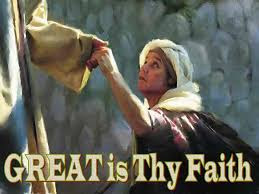 Then Jesus said to her in reply, "O woman, great is your faith! Let it be done for you as you wish." And the woman's daughter was healed from that hour. In our Epistle reading (Romans 11: 13-15, 29-32), St. Paul rejoices in his ministry as "apostle to the Gentiles". But in so doing, he expresses the hope that the Gentile's "joining to the Lord" will inspire his own countrymen to conversion. Brothers and sisters: I am speaking to you Gentiles. In as much as I am the apostle to the Gentiles, I glory in my ministry in order to make my race jealous and thus save some of them. For if their rejection is the reconciliation of the world, what will their acceptance be but life from the dead? For the gifts and the call of God are irrevocable. Just as you once disobeyed God but have now received mercy because of their disobedience, so they have now disobeyed in order that, by virtue of the mercy shown to you, they too may now receive mercy. For God delivered all to disobedience, that he might have mercy upon all. Most of our ancestors were once Gentiles (non-Jews) who worshiped other gods. And at some point, through the efforts of St. Paul and others, and the courage of the martyrs, they came to "join themselves to the Lord". And thus we have come into the wideness of God's mercy. May we lead others to the same through our own example and witness.